In this photo provided by McAllen Police, a woman is seen walking away from a crash involving a motorcycle at about 3 a.m. on Sunday Oct. 1, 2017, in McAllen near the 100 block of East Expressway 83. 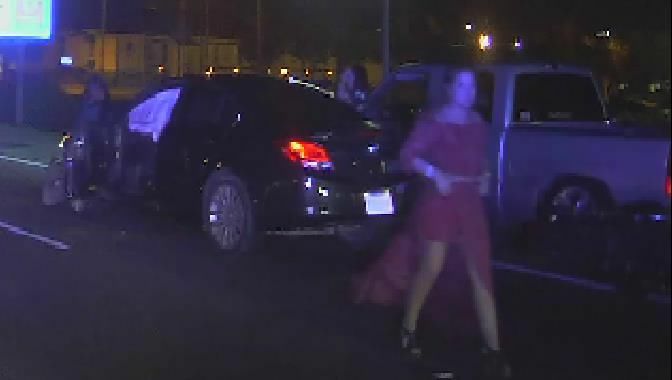 McALLEN — McAllen police are asking for the public’s help in identifying a woman in connection with a hit and run Sunday morning. At about 3 a.m. Sunday, officers responded to the 100 block of East Expressway 83 in connection with a crash involving a vehicle and a motorcycle, according to a news release. The victim, who has not been identified, suffered serious injuries and was transported to an area hospital. Police said the crash, which involved an adult woman driving a dark-in-color Buick Regal, remains under investigation. The woman’s vehicle sustained visible damage to its front end, and that the airbags deployed, police said. Anyone with information on the driver’s whereabouts may call McAllen Crime Stoppers at (956) 687-8477.